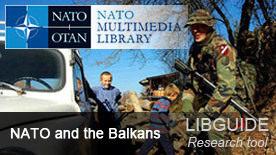 This LibGuide is intended to provide a few starting points to assist you with your research on issues related to NATO and the Balkans. The "Balkans" information web page, created by the Romania's Permanent Delegation to NATO (November 2014). On 23 January 2015, the NATO Secretary General Jens Stoltenberg says KFOR is a success story in the Western Balkans. On 2 December 2015, during the Foreign Ministers Meeting at NATO HQ, NATO invites Montenegro to start accession talks to become the 29th member of the Alliance. Led by NATO Deputy Secretary General Rose Gottemoeller, the North Atlantic Council (NAC) visited KFOR on 27 October 2017. (North Atlantic Council visits KFOR, confirming NATO’s commitment to Kosovo, 27 October 2017). Interview with Rose Gottemoeller, Deputy Secretary General of NATO, who was a speaker at the Belgrade Security Forum 2017 (11-13 October 2017): Gottemoeller: "We should speak out about benefits of Serbia-NATO cooperation" (European Western Balkans, 16 October 2017).